Add 1 tablespoon of olive oil to a large Dutch oven over medium heat. Add sliced sausage, white onion and celery to pan and cook 3 to 4 minutes until veggies soften. Meanwhile, peel and devein the shrimp. 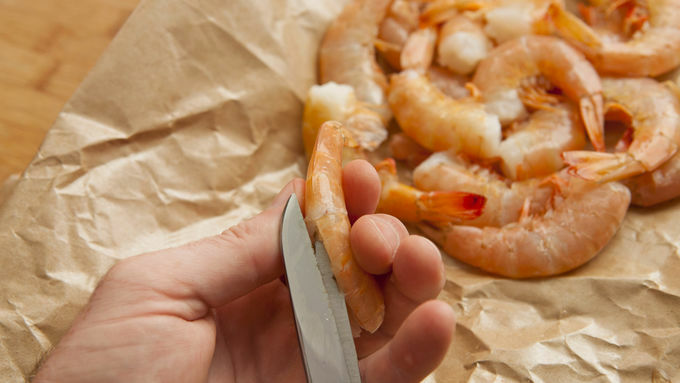 Tip: use a small paring knife or kitchen shears to cut down the back of the shrimp and wash out the vein. Leave tails on and set aside. Add tomatoes, penne pasta, Cajun seasoning and chicken stock to the Dutch oven. Bring mixture to a simmer and reduce heat to low. Cover and simmer for 6 minutes. Stir well, then replace lid and cook for another 4 minutes. At this point, the pasta will be mostly cooked and most of the liquid absorbed. 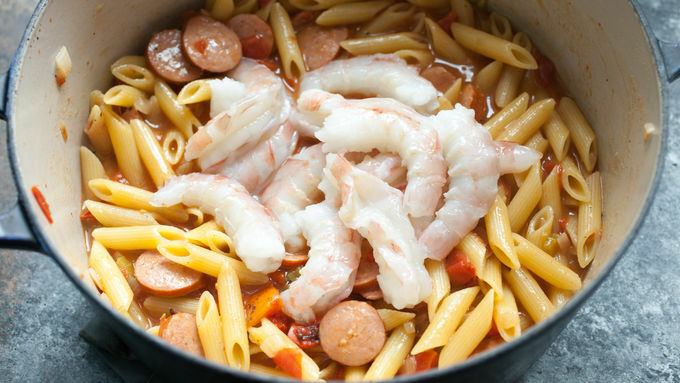 Add the peeled and deveined shrimp to the pan and stir to combine. Cover and cook 3 minutes more. Remove lid and give everything a good stir. Taste the pastalaya and season with salt and pepper to your liking. Garnish with fresh parsley. There are many Cajun seasonings in most stores these days. You can use any that you like for this recipe. Some have more salt than others, so be sure to taste the pasta after it cooks and only season with salt before serving. If at any point the dish looks dry, add more water or stock to the pot. The pot should never be completely dry. As my family has grown and my time has shrunk, my appreciation of the one-pot dinner has grown exponentially. The idea that you can toss things in a big pot, control a few factors, and have dinner on the table in a reasonable amount of time is very appealing to me. It’s also very appealing to the person doing the dishes (hint: sometimes also me). 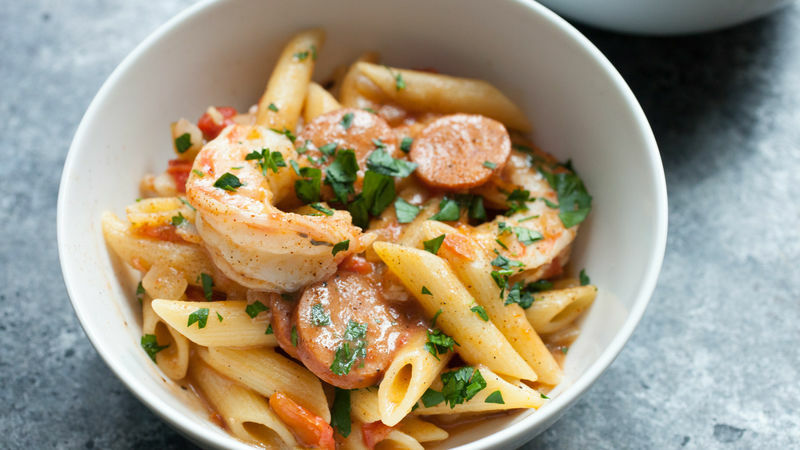 This pastalaya dish is a twist on the classic Cajun jambalaya, which is typically a sort of spicy all-in-one rice recipe. 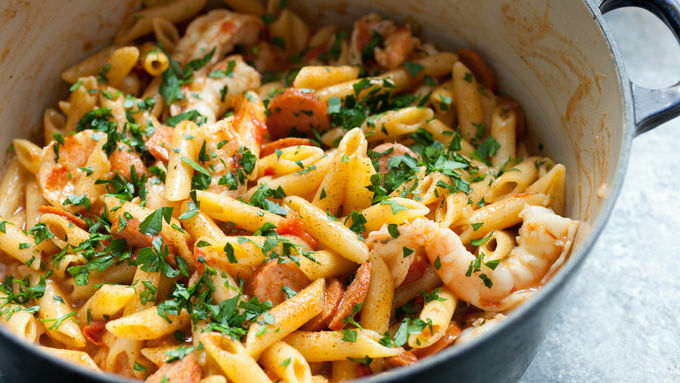 Adding pasta to it is a simple twist but actually makes the dish cook quickly and fills out the Dutch oven nicely. Plus, any leftover liquid in the dish becomes an instant sauce! The key is all in the order of ingredients. 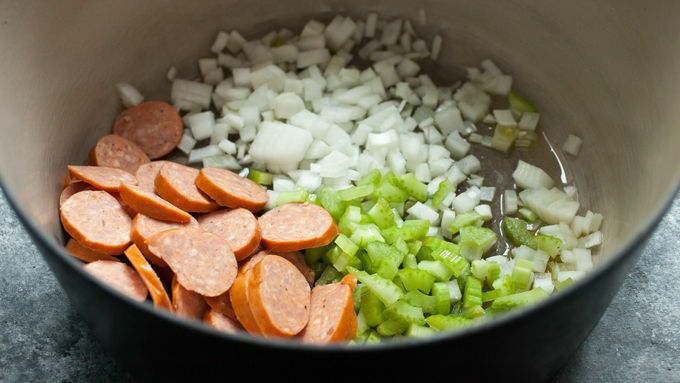 Start with the sausage, onion, and celery. Once the veggies have softened a bit, add the tomatoes, pasta, Cajun seasoning, and stock. Bring that all to a simmer and then turn the heat down to low. Cover it and let it simmer for 6 minutes. After 6 minutes, stir the pasta well to make sure the ingredients are distributed, then return the cover and cook for another 4-5 minutes. Now it’s time to add the shrimp. If you add them too early they will overcook and be rubbery, so now is the right time! Stir them into the pasta, return the lid, and cook for another 3 minutes. After that final cook, the pasta should be cooked, but it’s important to taste it at this point and season it with salt and pepper if needed. Spoon up the pastalaya and garnish it with fresh parsley. YUM!